Scenes from a Junkyard Planet: Shredded in Texas, Shredded in Japan. During the run-up to the November 12 release of my first book, Junkyard Planet: Travels in the Billion Dollar Trash Trade, every weekday I’m posting a new photo taken during my decade of reporting on the global waste, recycling, refurbishment, and repair trade. Today’s scene shows test cars being fed into a giant auto shredder at Toyota Metal (yes, that Toyota) in Nagoya, Japan. 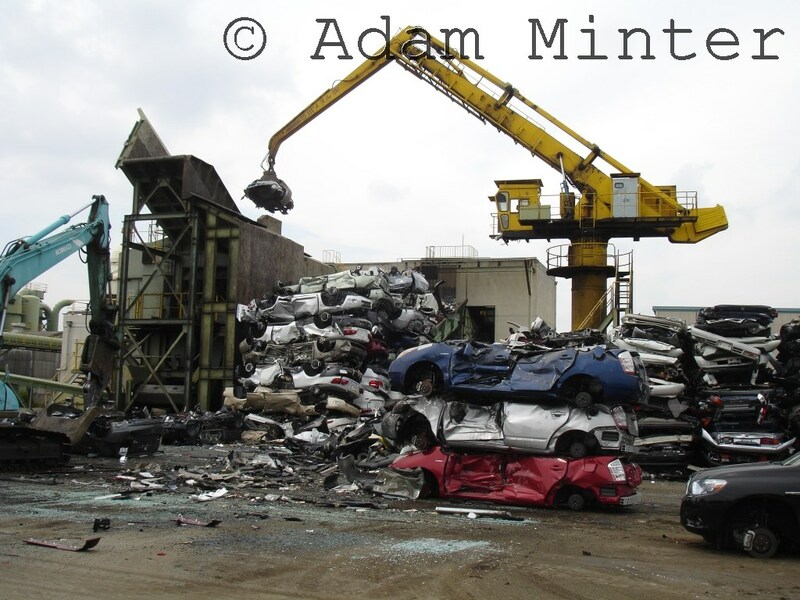 Taken in 2009, this image shows arguably the most important technological development in the history of metal recycling: the automobile shredder. Developed and perfected in Texas in the late 1950s and 1960s, the auto shredder was responsible for cleaning up the tens of millions of cars that Americans had abandoned to fields and alleys dating back to the 1920s. The idea is simple: instead of using hand labor to disassemble a car, shred it into tiny pieces and then use a magnet to separate out the steel. Execution, however, was another matter. Shredding paper is easy. A car? It took some engineering (so much clever engineering, in fact, that the American Society of Mechanical Engineers named the second automobile shredder a National Engineering Landmark). Today there are more than 600 metal shredders around the world, with the developing world – and its growing armies of automobile owners – the region where the machines are proliferating most quickly. The world is a cleaner, greener place for them. Up next – a look at how they work.